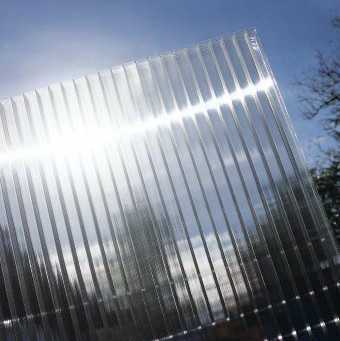 Multiwall polycarbonate glazing sheets - 4mm Clear Polycarbonate is supplied in Clear (only). The length can easily be trimmed with a stanley knife or fine toothed saw. 4mm Clear Polycarbonate transmits 88% of available light. I would recommend your affordable products (Multiwall Polycarbonate Glazing Sheets - Standard Rectangles | 4mm Multiwall Polycarbonate Glazing Sheets - Standard Rectangles | 4mm Clear Polycarbonate Sheet (Greenhouse Glazing) Twin Wall, 730mm wide x 1220mm long) to anyone else considering this product, as it has been superb. Omega Build Shop | Multiwall Polycarbonate Glazing Sheets - Standard Rectangles | 4mm Multiwall Polycarbonate Glazing Sheets - Standard Rectangles | 4mm Clear Polycarbonate Sheet (Greenhouse Glazing) Twin Wall, 730mm wide x 1220mm long. You are viewing Multiwall Polycarbonate Glazing Sheets - Standard Rectangles | 4mm Multiwall Polycarbonate Glazing Sheets - Standard Rectangles | 4mm Clear Polycarbonate Sheet (Greenhouse Glazing) Twin Wall, 730mm wide x 1220mm long, buy online today!